A Screenshot of my first version of CodeNode, at a very early stage. 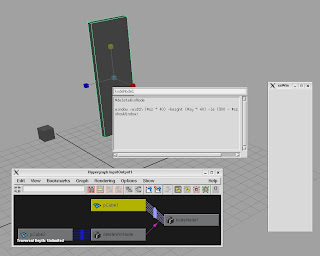 The concept is use connections and 3d-objects to generate code. In this way, lines of code can flow from object to object, creating a more dynamic code-structure instead of the linear text-file-structure, and making it more fun to be a scripter :). As shown in this very simple example, the height and width of 'pCube1' controls the height/width of the window to the right. 'kodeNode1' is getting some code from 'deleteWinNode'. Maya handles the creation and deletion of connections, and automaticly execute the final code. Right now, i'm only testing the idea in Maya, but my plan is to make it a stand-alone application.